dain wrote: Can you please stop doing redirections when clicking on a search result? While I don't like it, I do understand that this is a potential revenue stream for you, but please at least offer a no redirection / no ad version for people who donate! Could you please allow users to add their own search engines like dogpile peekier etc. Could you please add the google screenshots as an alternative below the pay service you are promoting on your addon? Could you check yandex ali express and and ebay they seem to constantly fail. rayquaza88 wrote: Could you please allow users to add their own search engines like dogpile peekier etc. but I can add the search engine that you need. rayquaza88 wrote: Could you please add the google screenshots as an alternative below the pay service you are promoting on your addon? rayquaza88 wrote: Could you check yandex ali express and and ebay they seem to constantly fail. hmm.. thank you! please wait new version. If you could add https://peekier.com/ and/or http://qwant.com/ as an alternative search engines it would be great. I'm sorry but I dont know much about those services but I know there are sites like peekier.com and scripts like googlemonkeyR and addons like SearchPreview that are for free and show site previews (thumbnails). Could you please add at least one of those free services as an option for people like me that dont know how to do that url thing you pointed to me before? rayquaza88 wrote: ...the pay service you are promoting on your addon? 100,000 views per month absolutely free. rayquaza88 wrote: I'm sorry but I dont know much about those services but I know there are sites like peekier.com and scripts like googlemonkeyR and addons like SearchPreview that are for free and show site previews (thumbnails). Could you please add at least one of those free services as an option for people like me that dont know how to do that url thing you pointed to me before? 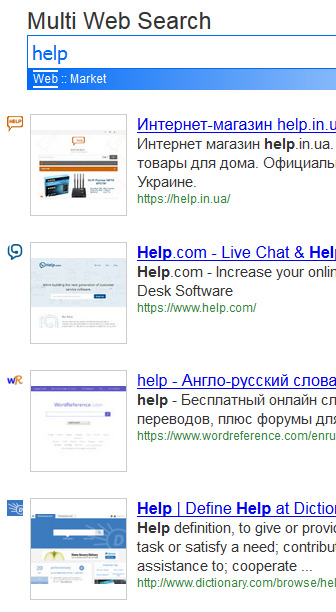 fixed: search engine for "AliExpress", "Yandex"
Thanks a lot man you are great. If it's not much to ask since stylish and similar addons that change the css of the page cannot be used on moz-extension pages could you someday add the option to display the results in multiple columns please? rayquaza88 wrote: If it's not much to ask since stylish and similar addons that change the css of the page cannot be used on moz-extension pages could you someday add the option to display the results in multiple columns please? That's very generous of you thank you. Would something like this be ok? rayquaza88 wrote: Would something like this be ok? fixed: search engine for "AliExpress"